A new book co-authored by Dr Andrew Wroe, Senior Lecturer in American Politics at the University of Kent argues that although Donald Trump may be the most 'unusual, unorthodox and unconventional' president the actual accomplishments of his presidency are, and will, be 'quite ordinary'. 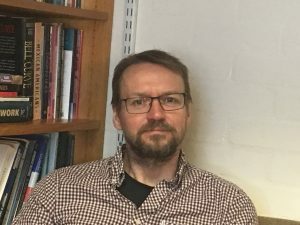 Alongside Dr Jon Herbert, Keele University, and Dr Trevor McCrisken, University of Warwick, Dr Wroe, senior lecturer in American Politics in Kent's School of Politics and International Relations (POLIR), argues that despite dramatic claims to be a revolution in US politics, Trump simply has not achieved very much. They outline this by noting that his few policy achievements are mostly mainstream Republican ones rather than the radical, anti-establishment, 'swamp-draining' changes promised on the campaign trail. The explanation for this discrepancy is that it is precisely Trump's extraordinariness as president that has rendered his presidency ordinary. The book, titled The Ordinary Presidency of Donald J. Trump was published by Palgrave Macmillan on 11 March. Dr Wroe and his co-authors will gave a free talk about the book on 11 March at the University of London's Senate House.